We faired well as the second half of the harness season launched in North America, featuring success in the U.S.A. and Canada. 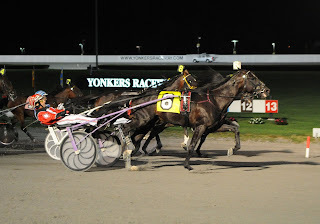 The long weekend took shape Saturday night at the Meadowlands when our New Jersey Sires Stakes (NJSS) finals produced a winner, an exacta and a triple, all in the same event. The soph-filly pacers’ $175,000 final presented, as we predicted, a giant favorite in Krispy Apple. However, we warned about a return to good form for Pretty Katherine and to use Myluvmylife. 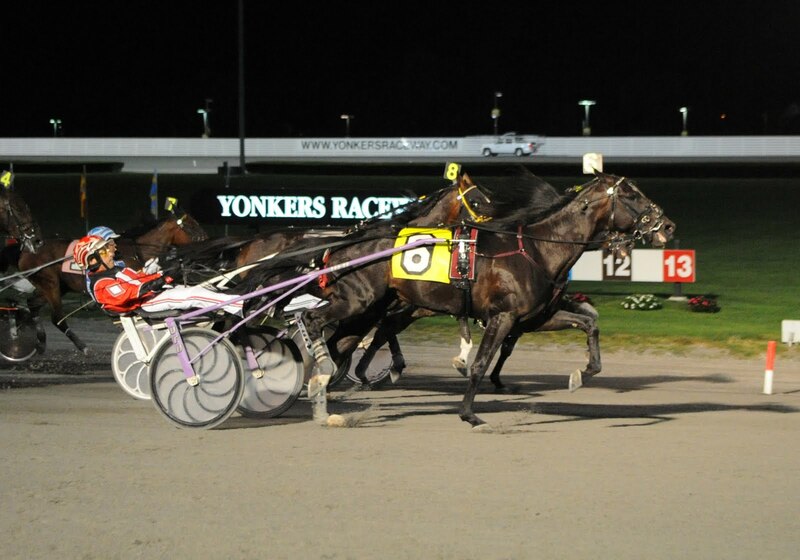 The latter failed for us on Hambo day but was all out in the NJSS final. “Katherine” looked like she was going to gun down “Apple” and soar home first but “Myluv” came wide and strong (at 2-1) to nail her. Katherine, who went off more than 10-1, was second, leaving Apple third. Although Myluv came in shorter than we wanted, those two were our choices and combined for a $57.60 exacta. With Apple third, the triple came back $123.20, enough to cover the weekend’s action with a profit. Sunday at Flamboro the two-heat Confederation Cup also confirmed our suspicions about the touted choice, Up The Credit. Since winning the North America Cup, “Credit” has been favored in most of the stakes where he appeared and each time we looked elsewhere for a winner and we were correct. 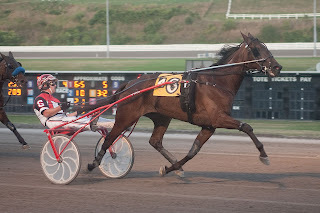 He’s a good colt but the “North Cup” was a trip event, with a bias, and winning it this year did not define greatness for the winner (in the past, horses like Precious Bunny and Rocknroll Hanover were significant champs). So, we looked for the best horse that would also offer some value. Our first choice, Bestofbest Hanover, finished fifth in his elim heat, just enough to make the final. But in the final he was 5-1 and did his best as Credit could not even finish the race without galloping. “Bestof” paid $12.60 to win. Our second choice was Mystician, who made the final and cut the mile until Bestof beat him. That exacta returned $77. At my Hoof Beats blog I restated something I have been talking about for years, the matter being the Hambletonian as a “key” race. Thoroughbred players know the key-race concept, that a great field can produce many winners in their next outing. The Hambletonian almost always spins off into races where you can take the winner to the bank no matter where in the classic he or she finished. It began already, as colts from the final and the elims have been scorching miles, some less than a week after the Aug. 6 final. The Hambo favorite, Manofmanymissions, was in the mix of the NJSS this past weekend and won from post 10. His gait was smooth and relentless (he broke in the Hambo trying to trot down our choice, eventual winner Broad Bahn, and finished eighth). Also winning were Bambino Hall (pictured left) and Big Rigs. Watch for the next two races including Fawkes, Opening Night, Chapter Seven, Whit, Whiskey Tax, Luckycharm Hanover and Magnum Kosmos. Also, some that did not make the final from elims, including Charlie De Vie. See You At Peelers scratched from a race at Tioga on Aug. 14, so she is still in pursuit of her 22nd-straight victory. The cause for the scratch was the condition of the track, which was labeled “sloppy.” Trainer Jimmy Takter said he didn’t think she liked the surface when she was warming up so he took her out of the event. She is scheduled to start at Chester on Aug. 21 in the $350,000 Valley Forge Pace as her campaign toward meeting the boys in The Little Brown Jug this September continues. Aug. 21 is the fourth edition of Super Stakes Sunday at Chester. The Pennsylvania track will host $2 million in stakes, including sophs in the Battle of the Brandywine, trotters from the Hambo trail in the Colonial Trot and lucrative consolations for the main events. We will be on top of those events in our Thursday blog. Due to the recent tragedy at the Indiana State Fair, the Grand Circuit racing program scheduled for Friday, Aug. 19, at the Indiana State Fair will now be held at Indiana Downs on Thursday, Aug. 18 with an 11 a.m. post time. The main events in that program include the Fox Stake, Hoosier Stakes, The Horseman and the Ralph Wilfong. We are intensely following the second half of the season rolls toward the Breeders Crown events, this year at Woodbine in Canada. Our “Crown” Countdown will begin soon.